Forgive my potential foolishness – and I feel I know what your answer is, I just want to be sure because its an interesting pick either way – but when you say Anastasius do you mean Anastasius I or II? Thanks!! The first, sorry for any confusion. I forgot there was a second because I think of him as Artemius. No worries at all. That was indeed the answer I figured it would be I just wanted to be sure. Given the nuance of your pick on both sides (as well as, on one other commenter’s observation, the Byzantine Empire has far fewer unmitigated disasters as rulers than its more ancient iteration it would seem!) you’ve somehow given me something to look forward to in 1453; listening to your explanation for these picks will be satisfying for sure. Anastasius as the best pre-1025 Emperor? I don’t know if I can wait to 1453 to hear your reasons (although I can make some educated guesses)! I’ll definitely have to review all pre-Heraclius Emperors because I wasn’t yet researching in the detail I do now. But I was struck at the time how different Anastasius’ attitude was to Justinian’s. Rather than be driven by ego and ideology he looked to maintain and manage and compromise. Given everything that has come afterwards I see much wisdom in that approach. Robin thanks for the great podcast. 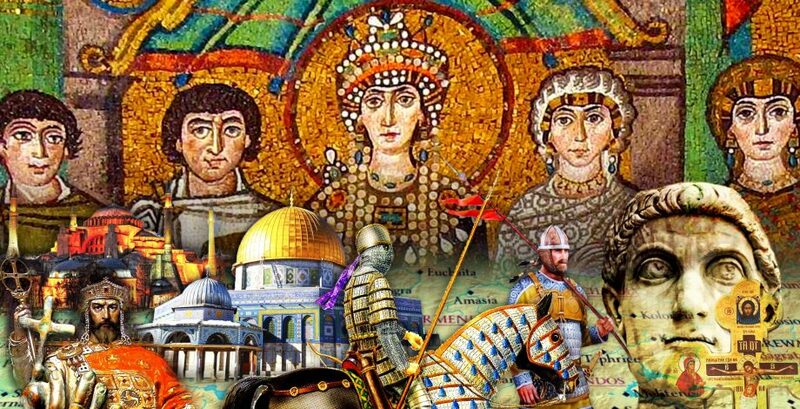 The episodes this year have really helped me to better understand the Byzantine Empire and have set a solid foundation for when the narrative resumes in 2019. I’ve been listening since 2012 sometimes I like to go back and listen to old episodes just to see how far the narrative has changed through the centuries. I’m looking forward to the 11th and 12th centuries and seeing familiar stories from the byzantine side. When you started the podcast did you imagine you’d still be going 7 years latter? Thanks for the excellent podcast. So boundary markers were evidently still in use delineating international borders at least, even if no references to their internal use survive. That list of worst emperors really puts into perspective how few absolute tar fires the Empire has had so far. Those five hardly seem so bad next to a Commodus or a Caligula. I’m curious if the next two centuries are going to feature some strong contenders for the bottom 5; Andronikos Komnenos at the very least seems like he should be on it. Yeah someone asked me why Byzantium seemed to produce less horrible Emperors. I think Christianity has a lot to do with that. I think actively tormenting/torturing or having orgies would have brought the Emperor into disrepute. It would have invited others to proclaim their piety as a reason to replace them. Also with the church as an institution becoming part of the State it was harder for the Emperor to act in truly mad autocratic fashion. Hey, Robin. Seeing Heraclius as the illustrative picture for the episode and then ending up with you picking Anastasius as your ‘best emperor’ post-fall of the West was quite the plot twist! So much, it made want to go back and re-analyse that period in more detail. Like you said yourself, the podcast didn’t go into the detail it does now, back when it was covering that period. Are you thinking of doing a sort of deeper analysis of previously covered stuff in the future, maybe after finishing the narrative after the Ottoman conquest? As of now, I’m going to delve into Warren Treadgold’s ‘A History of the Byzantine State and Society’ which I finally(!) got, because the whole period from the Theodosians to the Justinians is a bit murky in my head. I find it is a very underexplored period, when it could be one of the most interesting ones. Maybe because it is stuck between the much more compelling and famous stories of the fall of the West and the Arab conquest of the East. That whole period of around 2 centuries when the Empire just seems to get back on its feet, thrive and prosper and expand once again kind of runs against the tides of History. Fascinating! Hey, I am tempted to go and redo that whole period again but I’m not sure if that’s a good idea. I think I would get to Heraclius and want to redo that and then redo everything else and I’d end up like the snake eating its tail. Every year new scholarship comes out replacing ideas and theories from before so you could literally rewrite Byzantine history forever if new work keeps being done on it. I think it could be a good idea. For example, I recall watching extra history’s episode on the council of Chalcedon and I was surprised in how most of what was shown there (all the councils and re-councils) was almost nowhere to be found in either THoR or your first episodes. Given the importance of these events, I really would appreciate if you could some day record the pre-Justinian stuff to improve it. Regarding your emperor list, given how highly you value not seeking pointless wars and securing the succession, I was expected you would have included Alexander, as his short reign can be summarized in starting a pointless war and messing with the succession.